While cycle time remains a high target for the composites industry whose annual production volumes are exponentially growing, final part’s cost is critical to a majority of applications. To comply with those requirements, the material supply chain has been developing a wide range of products including fast-curing thermoset composites and lower cost thermoplastic based materials; in parallel, more and more manufacturing processes are being developed, which are getting more efficient but usually vary in part’s quality. For the automotive industry, integrating a composites production line represents a large capital investment, with the risk of purchasing a custom solution which may not be appropriate for future applications or adapted to evolving materials. This is in particular true for large or 3D products, where amortizing the acquisition of a very large press can only be justified by having a few major programs confirmed. In the aeronautical industry, bottle necks are often linked to hand lay-ups and the use of autoclaves, which present high running costs and require regular and extensive maintenance. Alternative solutions such as stamping processes are already in place for small components, but with a clear limit in part’s quality, dimensions and geometries. For large or 3D products, finding a viable OOA (Out-Of-Autoclave) solution which enables the highest part’s performances is a challenge. For this range of applications, Roctool developed the LIT™ (Light Induction Tooling) technology. The manufacturing cell offers a more efficient and more economical way to process a very wide range of composite materials, achieving short cycle times and exceptional part’s quality. This turn-key solution is dedicated to large parts, and has been proven to work very efficiently on 3D products or complex geometries. The Roctool LIT™ is now commercially available as a stand-alone solution to manufacture composites parts. It offers a full and accurate control over the parameters amongst which temperatures and pressures – including vacuum through the composite material. Its automation is delivered by a specific control unit, with the ability to connect to previous and next process cells. LIT™ stands for Light Induction Tooling and corresponds to the mold design and the integration of Roctool induction technology within. This solution can be used in a conventional press or autoclave, for instance to increase the thermal performance of heated platens or to heat both faces of the composite; this allows a better thermal control throughout the part, optimizing mechanical performances and reducing void content or internal stresses. Roctool performed a study for an aeronautical program, aiming at comparing the heat ramps within the composite laminate of a sandwich panel. The autoclave ramp is shown on the left; because of the large thermal mass of the tool the A-face remains at a lower temperature and differential heat ramps are observed with a 290°F gradient through the material. Using Roctool and aiming at a 15°F/min heat ramp, this gradient is reduced below 40°F over the same period of time. The LIT™ has then been extended to be proposed as an OOA solution where temperature and pressure controls are critical. Its last evolution is available as a turn-key manufacturing solution, where the technology is embedded in a simple but robust autonomous structure facilitating the investment over a large press. Its automation has also been developed to be integrated in a production line, with a full automatic mode and Industry 4.0 standards. RocTool’s patented technology consists in placing technical elements referred to as “inductors” into a metallic tool, in order to provide heat. The flexibility of those inductors allow them to follow complex 3D shapes, and a large range of integrations are available to match at best customer’s requirements. The LIT™ uses the same technology under new patents, integrated in a thin shell tool; this enables a refined temperature uniformity, a better dimensional stability and the ability to heat faster while reducing energy consumptions. As tooling investments can be high for large parts or when considering a number of references, the Roctool integration has been standardized and capital savings up to 40% can be achieved compared to more standard processes. With fast Heat&Cool cycles, the LIT™ is optimized for productions with difficult requirements involving temperature and pressure controls or larger than 50k parts/year. If smaller volumes are considered on a large number of references, the tool can be equipped with Roctool latest quick connections, allowing for an efficient change of the tool in a single supporting structure. The system, available for production lines early in 2018, will enable manual or automated connection to the mold; the different mold references could be stored away from to the molding machine, with QR codes available on each of them to speed up the process launch on a new production while avoiding operator’s errors. Similarly, further automation before and after the molding process can simply be adapted around the LIT™ process solution. The Roctool LIT™ is available in different configurations, and able to transform the full range of composite materials. For thermoplastics large heat rates are possible to shorten cycle times, as well as high temperatures dedicated to performance materials. With thermosets the focus is generally more oriented towards preset heat ramps and thermal control during the process. For composite productions using thermoplastic-based materials, reducing the heating step is critical since the material will only start its consolidation once reaching high enough temperatures. Being able to heat the mold rapidly, at rates up to 150°C/min, not only enables a cycle time reduction but a better consolidation of the composites at higher temperatures can be obtained. Part’s performances and quality therefore improve drastically. For challenging materials, temperature uniformity over the molding surface is crucial. The Roctool engineering team performs FEA on all incoming applications in order to optimize to customer’s requirements; at the highest rates it is possible to obtain below 5°C temperature variation on the molding surface, while during the holding stage this value can go down below 2°C. Both the cycle time and the nature of the mold material used for the mold will influence those values. More and more applications require high mechanical performances, high glass transition temperatures or fire resistant properties. The composite materials used are based on highly engineered thermoplastics, which require high heat capability for their consolidation. The Roctool LIT™ can achieve 400°C in different standard configurations, enabling the transformation of any thermoplastic-based composites. A temperature profile is given as an example below, on a process reaching high temperatures for the aeronautical industry. This configuration is defined as having 2 sides heating, for which the temperature uniformity is kept well. For the product considered no dwell time is necessary, which is not common for most material considering their thermal properties and présentations. To obtain optimal performances of the final product, when using high temperature semi-crystalline matrix systems such as PEEK, PEKK and PPS, it can be of interest to better control the cooling speed in order to reach higher degrees of crystallinity. The table below shows results for a few constant cooling ramps, as well as maintaining during 5 minutes the mold at different temperatures when reaching target températures. In order to optimize the cycle time for such materials, a non-conventional cooling stage can be proposed with improved results. 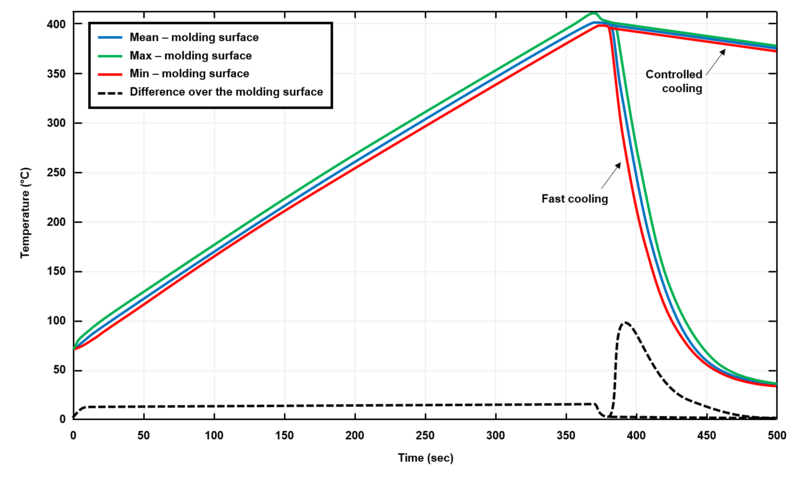 A fast rate can be used down to a target temperature, at which the mold would be kept isothermal during a selected duration or set at a slower cooling rate, before ending the cycle at an even faster rate – thus ensuring high performance and short cycle times. A large number of industries are still using thermoset-based materials, in particular in the aeronautical and automotive fields where the use of carbon fiber / epoxy resins prepregs remain dominant. Generally a highly accurate heat ramp is set by the material supplier, and different holding stages are recommended to allow for flow and then reticulation through the composite. The Roctool LIT™ has been tested with a range of fast curing prepregs, for which Design Of Experiments were conducted in order to better assess the mechanical performances to cycle time ratio. In this configuration vacuum could be drawn out through the tool, while a reusable membrane or conventional consumables were used on the B-face. Results were not only showing an excellent consolidation of the composite leading to the highest performances of the part, but also exceptional surface quality. 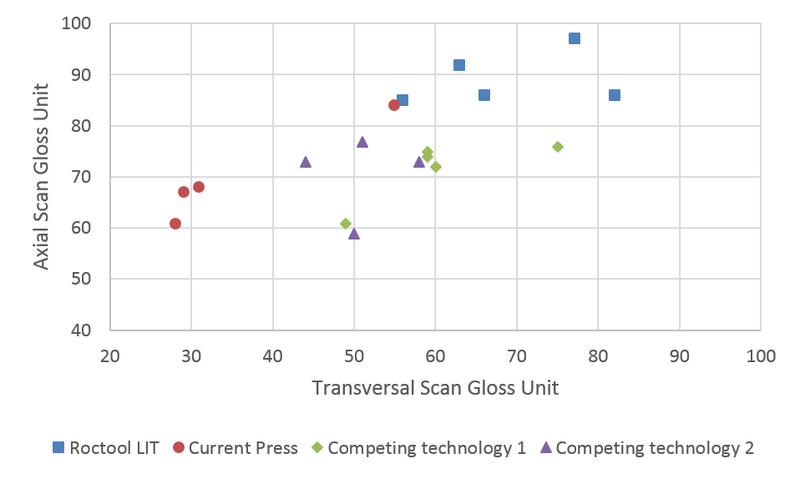 The aim of the study was to compare current technologies with the Roctool LIT™ and assess the potential savings in painting; deflectometry and gloss unit measurements were performed, for which some of the results are highlighted above. The Roctool LIT™ can be adapted to smaller parts with very difficult process parameters requirements, but it is truly optimized for larger parts. When reaching intermediate dimensions the process can outreach most performance requirements while being economically viable; for very large laminates it places itself as one of the only manufacturing solution for composites. Nickel alloys: standard nickel is usually available at low hardness levels, while nickel/cobalt alloys reach levels which achieve higher stability under higher pressure levels. Temperatures respectively can reach up to 220°C or 250°C, therefore adapted to automotive thermosets, TPO skins and some PP- or PET-based composites. This material can be built using electro-forming – an additive manufacturing process. Steel alloys: a very wide range is available and compatible with the Roctool technology, from regular to high hardness, and from high conductivity (such as the HTCS130 supplied by Rovalma) to more standard materials (such as 1.2311 and 1.2343 grades). Temperatures up to 400°C can be achieved, leading the way to the manufacturing of any TP-based composites, through a controlled investment cost and standard tool-building equipment. Invar alloys: a wide range is available, which is particularly well suited for large aeronautical parts thanks to its low Coefficient of Thermal Expansion, which facilitates dimensional stability. Each grade would have a Curie temperature, above which the metal becomes nonmagnetic – thus enabling an excellent thermo-regulation around this well-defined temperature. Invar alloys are commonly more expensive than conventional steels. The tool design and construction is focusing on reducing to a minimum its thickness and therefore thermal mass. This has a direct effect on the heat ramp and temperature uniformity capabilities, but also enables a mass heating of the tool; heating the tool totally through its thickness allows for a greater mold stability. Indeed, if a temperature gradient through the tool thickness was to appear, a deformation in the z-direction would be affecting the part’s quality, while reducing the tool lifetime. On a low thermal mass tool, the energy consumption used to heat at a set temperature is obviously kept to a minimum. With the LIT™ configuration, which is connected to a highly energy efficient Roctool generator, the global energy consumption has been computed on a 800 x 450mm panel, for different TP-based composites. This study shows that the LIT™ technology not only enables an investment cost control, but also drives a large reduction of those running costs. Some heating strategies may require to heat different zones of the tool independently. This can be performed through the use of a Dual-Zone generator system, which for each zone will be feeding an induction circuit and be connected to a thermocouple for control. For a larger number of zones, different generator systems can be used, all controlled by a central software enabling the use up to 12 systems at once. This capability can either be used for highly 3D tools aiming at an excellent temperature uniformity over the molding surface, or for tools used to consolidate thermoset laminates with various thicknesses. In the latter case, the heating strategy could be focusing on pre-heating the thicker section of the laminate, or on adding more thermal energy in this thicker section, in order to obtain a homogeneous temperature through the composite laminate. As an OOA solution, this option can lead to a more accurate control over the curing process, and shorter cycle times. Each industry has parts which present highly 3D geometries, or in order to minimize the assembly of smaller parts will consider manufacturing a larger and often geometrically more complex part. When considering box shapes, sharp angles, local recess, deep draws, the high temperature and pressure gradients on conventional processes often leads to poor product’s quality. A Roctool project always starts with an extensive analysis using a specific Finite Element Analysis software; this necessary step will drive qualified engineers to select an optimized integration of the Heat&Cool network in a LIT™ tool configuration. 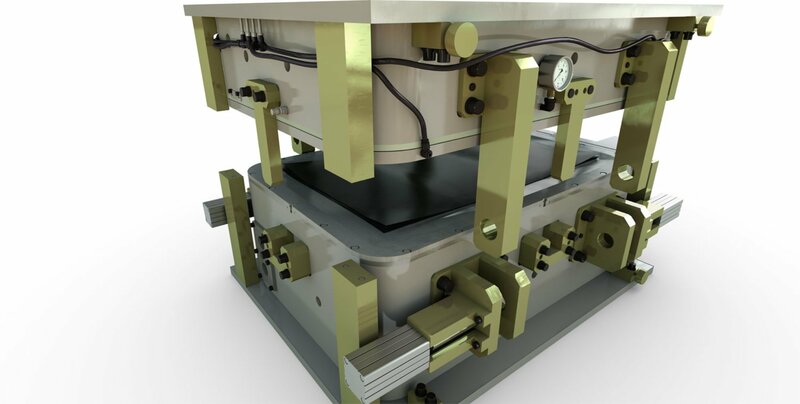 Through this analysis all the parameters linked to the induction and water channels are studied and analyzed, in parallel with the tool’s thickness, construction and edges détails. On a complex part’s geometry, the cooling channels may require a specific flow analysis in order to assess the cooling homogeneity along their path. On another hand, the Roctool induction hardware is fitted to the model to obtain a representation of the thermal activity on the molding surface during the compression cycle. The thermal analysis can also be completed with a thermo-mechanical study in order to assess potential deformation and fatigue. All this data is further confirmed by direct measurements during the installation of the tool on-site. Brazing on a shell: this sequence consists in building a tool with series of grooves in its back, before brazing formed plates above the cooling channels to have them watertight. 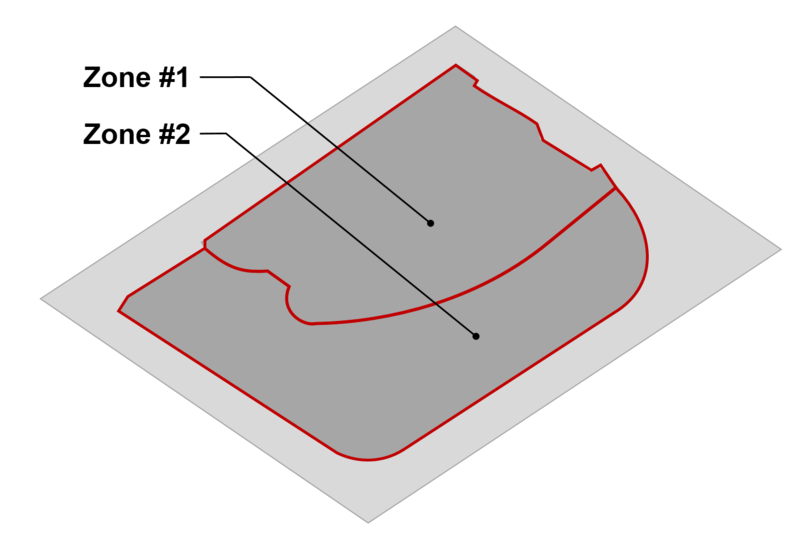 Formed 2D shell: in this case the heating and cooling channels are respectively grooved and drilled from a flat sheet of metal. The 2D shell is then formed using specific equipment in order to give it its final 3D geometry. Additive manufacturing: only adapted to certain metals, this approach remains an ideal option for its versatility and ability to build very complex geometries. The optimization of the profile through FEA enables the finest performances in terms of temperature uniformity, thanks to the addition of complex profiles on the edges to limit their effects. The results obtained while using a conformal Heat&Cool tool are double: highest mechanical performances of the laminate, and excellent surface quality with a homogeneous gloss over the surface. When using the LIT™ technology, the limit in geometry tends to not be linked to the tool requirements, but to the type of composite material to be molded. Most compression processes tend to promote the use of a press in order to apply the required pressure. For complex geometries a high tonnage press is often recommended, which applies a very large downwards force in order to retrieve sufficient sideways forces to consolidate the vertical sides. The material therefore has variable properties through the part since its consolidation had different pressure levels, while the horizontal areas are usually distorted due to high pressures. In order to avoid this phenomena, the LIT™ can be integrated with a flexible and reusable membrane, which will distribute the pressure over the part’s surface. In this configuration pressures up to 25 bars are industrially possible, while the membrane can form up to a few thousand parts before needing a replacement. It is particularly well adapted to lower temperatures matrix, and to applications where tooling cost is a critical part of the Investment. The effect on the material is mostly seen on the mechanical performances and their stability over the product’s surface. For low viscosity matrix such as thermoset resins, it is recommended to also complete the integration with a vacuum capability – performed by adding vents in the tool and adapting the membrane technology – to obtain the lowest levels of void content leading to highest product’s performances. Through accurate control over the process parameters, the LIT™ stands as a high performance manufacturing solution. It enables the transformation of a wide range of composite materials, leading to parts with high mechanical performances and perfect surface quality. Its specific mold integration, which holds some of Roctool’s latest patents, is versatile enough to adapt to most large and complex geometries; its engineered mold design facilitates the customization of the process to match automotive and aeronautical requirements. Proposed as a turn-key solution, the LIT™ can be seamlessly integrated into current or future production lines. Its controls are fully compatible with potential specific automation around the process, and its software can export quality control data in order to optimize the production rate or the product’s performances through designed iterations. Globally, the LIT™ solution also contributes to managing costs around the process, through low energy consumptions even for high temperature composites, and with a controlled capital investment compared to the acquisition of a large autoclave or of a large press. Often a high performing transformation process is not sufficient, the LIT™ can therefore be coupled in particular with material lay-up equipment. For very large structural parts, an ATL (Automated Tape Laying) or an AFP (Automated Fiber Placement) can drape directly on the Heat&Cool tool, facilitating the first ply’s adherence and enabling a thermal control in order to eliminate potential part’s warping. Consolidation or co-consolidation of the component(s) can then be performed directly in the LIT™ tool. For more complex and 3D parts with mechanical and aesthetic requirements, the use of a dedicated preform is always seen as a preferred option. Different options are currently being tested in the industry, offering shorter lay-up times and therefore cost savings, as well as the ability to keep fiber continuity in 3D features such as corners and ribs. Those alternatives are proposed under various patents: knitting structural yarns, stitching a continuous yarn on a backing textile or film, welding tape plies, or more simply counting on the high deformability of non-woven materials. Overall the material supply chain and the selected process are strongly linked in order to deliver products matching OEMs performances, quality and cost expectations. This technical complexity naturally leans towards customized installations, which may tend to lose their versatility for other products or programs. The decision process is therefore forced into the acquisition of standard equipment with lower performances; but with the industry global growth, manufacturing solutions combining product’s quality and efficient processes are starting to become a necessity. By Lionel Schaal, Key Account Manager@ Roctool.